The detail that MRI brings to breast cancer screening and diagnosis is the subject of frequent study. The higher sensitivity of MRI vs. the greater specificity of other modalities and the issue of false-positive rates are frequent topics for analysis. Evidence from the following three studies presented at the American Society of Breast Surgeons annual meeting this spring brings some focus to the issues of MRI as a surgical management tool, a diagnostic tool in conjunction with targeted ultrasound, and as a potential tool in the breast cancer screening process of patients with lobular carcinoma in situ. A study conducted by physicians from Jacobi Medical Center and Albert Einstein College of Medicine, both in Bronx, N.Y., found that 3D volume-reconstructed breast MRI subtraction maximum intensity projection (MIP) images rotated and viewed in all planes (MIP maps) provided better tumor detail than other MRI sequences. In many instances, the study found the MIP views superior to those of mammography and ultrasound. In addition, the introduction of MIP into the imaging process positively influenced surgical management for patients, allowing surgeons to optimize strategies for local resection. MIP is a method of 3D postprocessing reconstruction used to display structures of interest and pathology. MRI images gathered through a routine 2D manner can contain thick slices or interslice gaps, meaning they could not be reconstructed into other planes without losing significant image resolution. In cases where that resolution is necessary, scans need to be repeated in those specific planes. Volumetric imaging or 3D MRI can help overcome this problem. Throughout this nine-month study, a dedicated breast imager interpreted MRI images of breast tumors, as well as mammography and ultrasound images, and compared views taken from the different modalities for the demonstration of the local extent of the cancer. Mammography, ultrasound, and postbiopsy MRI were used to evaluate 27 breast cancer patients with a mean age of 57. A majority of those patients suffered from invasive carcinoma, while seven had cancerous cells growing only in the ducts outside the breast. Nineteen of the 27 patients had segmental nodules and microcalcifications or focal masses; in 16 of those 19 patients, MIP maps were found to be superior to other MRI sequences in assessing the extent of local disease. • proximity to the chest wall and skin (five of 16 patients). The remaining three patients showed minimal MRI findings. 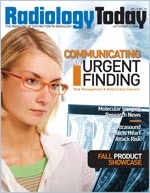 Microcalcifications were only found in eight patients. MIP maps changed surgical management in three of those patients, two patients showed calcifications with little MRI enhancement, and the remaining three patients showed no MRI findings. At Grant Medical Center in Columbus, Ohio, physicians examined the incidence of false-positive findings on breast MRI after targeted ultrasound in patients with a diagnosis of breast cancer. This study stemmed from earlier conclusions that targeted ultrasound can be a reliable method to correlate MRI abnormalities in a majority of breast cancer patients. The latest study’s purpose was to investigate the false-positive rate of MRI for additional suspicious breast lesions previously identified by ultrasound. Between January 1, 1999, and July 15, 2004, medical center physicians conducted breast MRI exams on 270 women. In all, 73 total lesions were identified by targeted ultrasound and 56 were biopsied. Of those 56, 17 were either high risk or malignant and 39 were benign. Seven lesions were not biopsied but identified as benign by ultrasound or with other follow-up imaging. Ten benign lesions were confirmed after surgical removal. The overall number of benign lesions identified by targeted ultrasound, core biopsy, or surgical removal was 56. With these numbers, physicians concluded that in women with newly diagnosed breast cancer, the false-positive rate for MRI in identifying additional lesions detected by the ultrasound scan is 77%. Physicians at Pennsylvania Hospital in Philadelphia conducted a retrospective analysis of surgeons’ reports from 28 patients with a known tissue diagnosis of lobular carcinoma in situ. Oncologists have learned that women with lobular carcinoma in situ are at an increased risk for developing invasive breast cancer. The study’s purpose was to evaluate MRI as a screening tool for early breast cancer detection for patients diagnosed with lobular carcinoma in situ and negative mammography findings. Study patients had a tissue diagnosis of lobular carcinoma in situ and a screening with both conventional mammography and bilateral breast MRI within three months of each other. In this study group, cancer was detected in 25% of the patients in advance of any conventional mammographic findings, with only 11% receiving an additional biopsy for benign pathology. Specific results showed abnormalities in 10 patients with MRI, and those lesions were subsequently biopsied. Seven of those 10 patients were found to have malignancies, and three patients returned benign findings. Breast MRI is evolving as an adjunct to conventional mammography and shows promise for earlier detection of breast cancer in high-risk populations. The American Cancer Society says women at high risk for breast cancer should undergo an MRI and a mammogram every year but stresses that MRI should not replace screening mammography. While MRI is a more sensitive test and is more likely to detect cancer than a mammogram, it may still miss some cancers that a mammogram could detect. Brian Englander, MD, a radiologist at Pennsylvania Hospital who worked on the study, says that lobular carcinoma in situ is not included among the high-risk criteria for breast cancer, but that as this study showed, MRI can be beneficial in the early diagnosis of breast cancer for women known to have it.